May 2019. Activities are held 10am-5pm, providing plenty of opportunities to learn and have fun. Events are held throughout the town. The festival is free to attend and offers a variety of educational pursuits and entertainment. Our prestigious partners include the Natural History Museum, British Antarctic Survey, Geological Society, Jurassic Coast Trust, Natural England and teams from several universities. Iggy the Iguanodon Restaurant is also returning after a successful debut at last year’s festival – Iggy is a unique piece of street theatre featuring pioneers of palaeontology, including Lyme Regis’s own Mary Anning. This year’s theme is Time, Tides and Tectonics, exploring the global forces which have impacted – and continue to impact – our world and the Jurassic Coast in particular. There is a varied arts and science programme, including talks and fossil walks, providing something for everyone. Activities for all ages are on offer, including sieving for sharks’ teeth (which you can keep!) with the Natural History Museum and creating ‘Ammonite Slice’ sculptures with local artist Darrell Wakelam, and new this year, come and help create the ‘Sand Time Walk’, a series of sand sculptures depicting creatures and events from the Jurassic Coast geological story. There will also be stalls selling a variety of fossils, jewellery and dinosaur gifts. 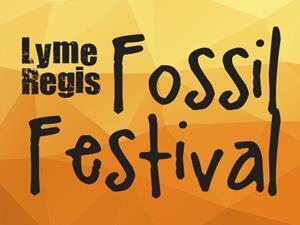 Lyme Regis Fossil Festival offers fun for the whole family, inspiring young and old alike. Please note that Friday is schools’ day, so some of our partners may not be able to accommodate the public.